About midway through Tom McCarthy’s award-winning newspaper drama Spotlight, one of the film’s crusading journalists makes a shocking discovery: Right down the block from where his children live and play is a rehab house for Catholic priests—a place, in other words, where disgraced clergymen lay low after the church finds out about their pedophiliac indiscretions. The moment is played for queasy dread, as this horrified father gapes in disbelief at a sanctuary for sexual predators, hidden in his own neighborhood. 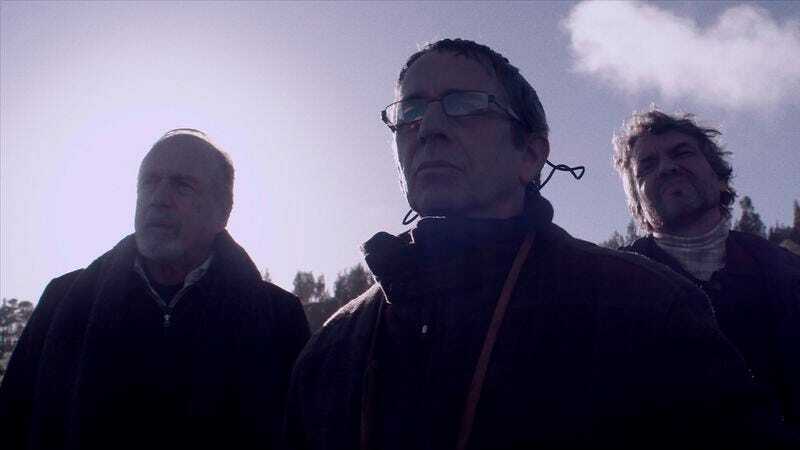 The Club, the new film by Chilean director Pablo Larraín (No, Post Mortem), effectively reverses that gaze: Here, our main characters are the fallen-from-grace holy men themselves, peeking out through tightly drawn curtains. But this is no sympathetic drama of absolution, no portrait of forgiveness sought by sinners. Larraín is after something trickier and harder to pin down; he asks us to share real estate with these men, while offering few windows into their heads or hearts, or even a clarification of their crimes. There are four of them, all middle-aged or older, living together in a bright yellow house on a hill overlooking the sea. A nun, Sister Mónica (Antonia Zegers), cooks and cleans, while gently enforcing the Vatican’s rules: No communicating with anyone outside the property; no being seen together in one place; no masturbation or self-flagellation. Mostly, the ex-priests pass their long, lonely days training a stray greyhound to compete in the Chilean beach town’s weekly dog-racing tournament, then watching the event from afar through binoculars and covertly squirreling away their earnings. They seem less regretful than terminally bored. The Club efficiently establishes this series of mundane routines, before disrupting it through a pair of big incidents. First, a new arrival to the house promptly commits suicide when one of his apparent victims, now-grown fisherman Sandokan (Roberto Farías), tracks him down, shouting graphic accusations from the front lawn. Next, the four surviving priests are visited by another man of the cloth, Father García (Marcelo Alonso), sent to evaluate this secret commune. “What I want is a new church,” he tells the others—and it becomes clear quickly that he’s come to coax full confessions out of each of them, after which they’ll likely be forced to return to their old communities and face judgment for their crimes. It’s a crusade to right the wrongs of the church’s look-the-other-way policies, to sweep everything out from under the rug. Another filmmaker might have treated this all as set up for a lot of anguished soul-searching: the redemption of four bad men, finding their way back to the light after succumbing to the dark (to put it in the terms established by an opening Biblical verse). But Larraín doesn’t let anyone off so easy; his characters—cut off from society, punished through isolation—have learned to forget, to rationalize, to deny. One of them, the aged Father Ramírez (Alejandro Sieveking), has gone senile, his mind robbing him of any opportunity to actually remember, let alone make amends. Another, Father Vidal (Alfredo Castro, a Larraín veteran), cops only to being gay, which he claims to have successfully squared with his faith; whether the church excommunicated him for sleeping with a grown man or a boy is never entirely clarified. In fact, The Club is deliberately vague about the details of all these priests’ exiles. The sins of their collective pasts are personified in the figure of Sandokan, who’s always there on the periphery, like the ghost of every innocent child they damaged for life. Larraín films The Club in muted colors, washing out the beautiful seaside scenery; if No was shot on archaic cameras to capture the tacky aesthetic of ’80s commercials, this one looks like it was filmed using a custom lens filter called Overcast Funeral. Directly or indirectly, the writer-director’s previous films were all about the Pinochet regime in Chile. It’s tempting, by contrast, to call The Club his biting take on the Catholic church, especially once he shows the lengths that Father García—a man of supposed integrity, seemingly committed to ending the vow of secrecy surrounding these abuses—will go to shelter his institution from scandal. And yet the film seems to resist big-picture readings; it’s more about the enigma of these men’s psychologies. How could someone spend years of their life with nothing to do but think about their mistakes and still come out unwilling to acknowledge them? Larraín has no answers, just tough questions and the deafening silence they provoke.